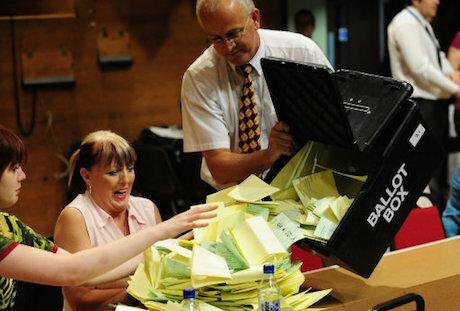 Ballot-counting begins in European and local elections. Photo: John Giles / PA Archive/Press Association Images. All rights reservedThis is the third part of our debate about the campaigning organisations 38 Degrees’ neutral stance in the EU referendum. To read more on this, see parts one and two. In my original contribution I criticised 38 Degrees for its neutrality during the referendum and its narrowing of the options for Brexit afterwards. I’m glad that David Babbs acknowledges problems with 38 Degrees handling of Brexit, including ‘flaws and omissions in the statements the staff team emailed out’ in its ‘DIY Brexit’ campaign. It’s particularly good that the issues I highlighted - the lack of opportunity to opt for the Single Market and freedom of movement, the false assumption that the UK will make savings from Brexit, the ‘£350 million’ figure and other deceptions of the Leave campaign - are raised (directly or indirectly) in supplementary questions on the DIY Brexit project, circulated to 38 Degrees members on 23 August. I’m pleased that he recognises the part my critique played in prompting this rethink - a rare case where writing for openDemocracy has seen such a rapid political result! More generally, David provides a cogent explanation of the dilemmas and thinking of the 38 Degrees staff and I am grateful to him for engaging seriously with my criticisms, including a lengthy telephone conversation. His reply has helped us understand better how 38 Degrees ended up with both the original neutrality and the later ‘DIY Brexit’ policies. However it doesn’t make either of these policies right, and it leaves some troublesome general questions about how 38 Degrees works. What I take from engaging with David is that the 38 Degrees staff team see their role as ‘understanding and serving the wishes of 38 Degrees members’, but in order to do this normally seek a common denominator, a position that can unify most if not all of its members. They are reluctant to put to members propositions that won’t get 80 to 90 per cent agreement. In the context of Brexit it is obvious that ‘this was and remains a tricky task’. I don’t criticise 38 Degrees for seeking common ground. I accept that ‘good people who share similar values made different choices’. I certainly wouldn’t claim that Remain had ‘a monopoly on decency’ or Remain voters are ‘better’ than Leavers. As a 38 Degrees member myself, I agree that the campaign belongs just as much to its members who chose to vote Leave as it does to those in the Remain camp. This doesn’t, however, mean that hard choices could or should be avoided, when a binary referendum has pared them down. Nor does it mean that each choice is of equal value. As David acknowledges, there are ‘good reasons, underpinned by good values’ for ‘support for remaining in the EU’. From a progressive point of view, I don’t think that the same can be said, to the same extent, for Leave choices. The best way for Remainers to respect Leavers (and vice versa) is by honestly challenging their beliefs. Therefore the referendum choice should have been confronted, not manouevred round, in 38 Degrees. A ‘mainstream, inclusive, non-partisan campaigning community’ should not be one that ducks real debate about the most serious national issue of our time. Caring for members on both sides was not a good enough reason for the staff team to steer members towards neutrality. Dressing up the cop-out as ‘people-powered fact-checking’ (the hyphenated adjective is woefully overused) added insult to injury. David sums up the rationale of 38 Degrees’ post-referendum move to ‘people-powered Brexit’ Corbyn-style, in the words of ‘Jake from Yorkshire’: ‘Following our vote to leave Europe, whether people voted to remain or leave is irrelevant. The die is cast and we need to make the best of it we can.’ David presents this as a view that both Leave and Remain supporters can embrace, but it is not. The referendum resolved only the basic principle of EU membership, but the practicalities are fearfully difficult and complex - in some ways even more so than Remain argued, as a huge number of experts have pointed out. Key unresolved issues like the Single Market, freedom of movement, and the Scottish and Northern Irish questions are so profound that it is not certain that the Government will find a way through them that will satisfy the electorate or Parliament. By following Jake’s questionable wisdom and drawing up DIY Brexit, which David accepts was a major departure and ‘38 Degrees’ most ambitious attempt at crowd-sourcing policy so far’, the office team was taking a lead from its Leave members and sidelining the substantial number of Remainers who believe that Brexit needs to be continuously challenged. I don’t accept David’s explanation (for the flaws and omissions) that the consultation process was just ‘a bit haphazard’ and ‘the initial draft was flawed because we sent it out quickly, knowing that the best way to identify improvements was to enable the whole membership to feed-in’: DIY Brexit was announced in an email on 4 July (as I pointed out, only 10 days after the referendum result - that was rushed) but the first questionnaire on the economic aspect of Brexit didn’t go out until 29 July, 25 days later - ample time for all major angles to be considered. No fewer than five questionnares involving 75 statements were issued - ample scope, you’d have thought, to cover all major questions. This was hardly just an ‘initial draft’. So I don’t think that time or space considerations explain the perverse outcome that 38 Degrees’ staff team offered its members an opportunity to define Brexit without addressing free movement and the Single Market. Accepting David’s assurance that they had no collective political agenda to exclude these options, the only conclusion we can then draw is that - as with the initial avoidance of a position on Leave vs Remain - the avoidance of conflict and division within 38 Degrees acted, consciously or unconsciously, as the staff team’s main reason for keeping ‘controversial’ options off the table. David denies that what is at stake here is the ‘power of a small group of unelected people to set the agenda’. I agree it is more complicated than this suggests, if the staff team are not themselves Leavers but pandering to the views of the large minorities of Leavers and pro-migration control supporters (who are not necessarily the same people) among their members. He warns me against becoming ‘suspicious of participative and people-powered approaches to politics’, on the basis of this experience. However I think a deep flaw of crowdsourced politics has been revealed. In a movement with no elected leaders, unelected officers may still wield the power to block members engaging collectively with difficult issues and feel compelled to keep controversial options off the agenda - if only because of their beliefs about what members think. Unlike elected leaders, the staff of an organisation like 38 Degrees do not feel they have the authority to ask questions which provoke large groups of their members. They may well worry that an amorphous movement held together mainly through online petitions will not have the cohesion to face divisive challenges together. Crowdsourced politics has real strengths - as 38 Degrees’ excellent new campaign over NHS cuts reminds us - but it may not be up to the toughest challenges of building progressive communities.